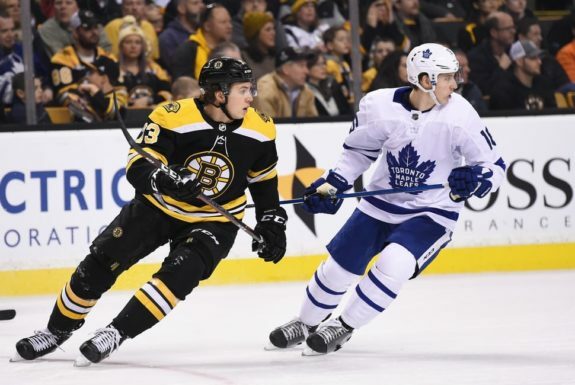 Brad Marchand, Auston Matthews, Patrice Bergeron, Patrick Marleau, David Pastrnak, James van Riemsdyk—the list goes on and on of big names squaring off in the Boston Bruins and Toronto Maple Leafs series. Surely they will all contribute strongly to their teams in some way, shape or form. What is uncertain is how prominently the younger players will show up in the playoffs. To win a best-of-seven series, a team must witness contributions from every player on its bench. Success in the regular season does not necessarily translate to the postseason—it’s a clean slate and an entirely different type of hockey game. 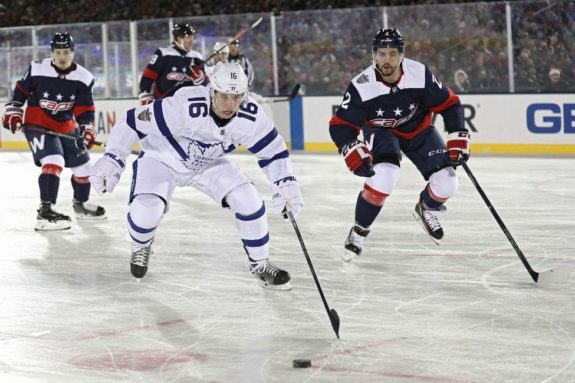 Will Mitchell Marner and William Nylander continue their dominance with the quickened pace and intensity of the NHL playoffs? What about Danton Heinen, Charlie McAvoy, and Jake DeBrusk? The Bruins have arguably the best line in hockey at their disposal. Marchand, Bergeron, and Pastrnak all reached the 30-goal plateau during the 2017-18 regular season. While contributions from role players like Riley Nash, Noel Acciari, and Tim Schaller have been key to Boston’s success this year, the most surprising aspect of the team has been the way that the rookies have made an impact. 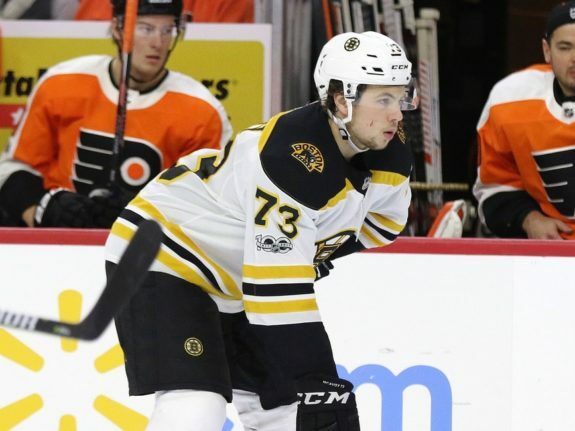 McAvoy was expected to have a strong season, but to register 32 points in 63 games as a rookie defenseman is no small feat. The 20-year-old has also made a home for himself on the Bruins’ top defensive pairing alongside Zdeno Chara. While there are 20 years separating the pair, they complement each other very well. Chara’s strengths are his long reach and physicality in fending off attacking forwards, and McAvoy is able to zip around the zone to break up plays and move the puck up ice. More awestriking is the way that Heinen and DeBrusk have shown up in their rookie campaigns. They ranked fifth and seventh in terms of point producers for Boston during the regular season and have both seen power play time as well as shifts with coveted second-line center David Krejci. Both rookies netted 16 goals this year while Heinen tacked on 31 assists—just four more than DeBrusk’s 27. But it doesn’t stop there. Matt Grzelcyk has taken on bottom-pair duties, bringing an element similar to Torey Krug in terms of being a puck-moving defenseman. He’s pitched in with three goals and 12 assists in 61 games, but a lot of the 24-year-old’s production goes without reward. Grzelcyk does a stellar job of skating the puck through the neutral zone and then making a pass or simply dumping it into the zone in a place where a teammate can apply pressure. It’s these little things that often lead to goals without padding the young defenseman’s stats. While Boston’s top line will undoubtedly make up a lot of the team’s offense these playoffs, the Bruins will need their younger players to pitch in as much as possible if they want to pass by the Maple Leafs. The Maple Leafs were led in points this season by Marner (69), Matthews (63), and Nylander (61). In just his sophomore season, it’s amazing to think that Matthews is already expected to be among the top Leafs production-wise. But he is, racking up 34 goals and 29 assists in 63 games—just six points fewer than he put up last season when appearing in all 82 games. Many expect the 20-year-old to be a dangerous threat to the Bruins’ success in the first round of the playoffs. Then there’s Marner, who has solidified himself as a force to be reckoned with this season. The fourth overall pick of the 2015 NHL Entry Draft eradicated any concerns of a sophomore slump, producing 22 goals and 47 assists in 82 games. The most lethal part of Marner’s game, like many members of this year’s Maple Leafs squad, is his speed. He can breeze by defenders in a flash, and if the opposing team somehow catches up to him, he can make up for it with silky stick-handling that opens up enough ice for him to uncork a dangerous wrist shot. The question is whether or not Marner can ramp up this style of play to match the intensity of the playoffs. Nylander registered 20 goals and 41 assists this year, matching his point total from last year. But that in no way means that the eighth overall pick of the 2014 NHL Entry Draft is plateauing. In fact, Nylander has ramped up his game. The most impressive weapon in the 21-year-old’s arsenal is his shot, and more specifically, his quick release. The 6-foot, 191-pound forward can get the puck off his stick quick enough to leave a goaltender stunned. He’s also able to sniff out passing lanes and string the puck to his linemates. With all of that said, if the Maple Leafs are to avoid returning to Toronto down 2-0 in the series, they will need Marner and Nylander to bring their A-games. If not, we could see more of the same from the boys in blue.